Yup, that pretty much sums up my life the last few days. As you know, I saw my Osteopath last Thursday and had to take a few days off running but was able to get back to it Sunday night! The plan was to run 3-4 k but I ended up running an easy 5 k 🙂 It felt so comfortable. I had no pain during my run or after which has been normal the last 4-6 weeks. The majority of my pain is when I sit to long at work/in the car. Yesterday, I managed to get through my work day without any pulling on my hamstring but felt like someone had punched my hamstring/IT band area. It felt completely bruised and hurt to touch but wasn’t painful, if that can make any sense. However, in the morning there was no bruise to be found. After having a conversation with my co-worker, we figured the Osteopath treatment I had must have released something and cause the bruised like feeling since I ran. Therefore all the muscles were able to relax and not pull causing me pain. Bonus! When you work out, you rip the fibers in your muscles and then they need time to heal and grow stronger. So, we figured it was my muscles reacting to healing and not all the painful pulling I’ve been experiencing over the last 4 months. The muscle is rebuilding…I guess…I’m not an expert in that field but am sure going to ask my Osteo person why I had the bruise feeling when I see her next week. I took last night off running since I felt like my leg needed a rest and thought I should just take a look at my leg to see if there was anything there. Sure enough my leg WAS still there ;)…. and bruised! It came out of no where and is bigger today. Initially when I pulled my hamstring back in December playing soccer, I had zero bruising and my Doctor, Physiotherapist and Massage Therapist were all surprised that I didn’t have any. Well….now I have it. So far I have no pain in my hamstring – no pulling at all! My leg feels really good…like my whole leg/glutes etc. and I’m not sure how long it’s been since I felt this way. Probably since last December. I have a 5k in 2 weeks that I’m excited to get ready for. And in other exciting news….Hilary is potty training! So far it’s a love hate relationship and is a little harder than with Lilly. We are taking a slightly different approach only because we now have two kids to manage….we foam roll in between running laps and attempting the potty. 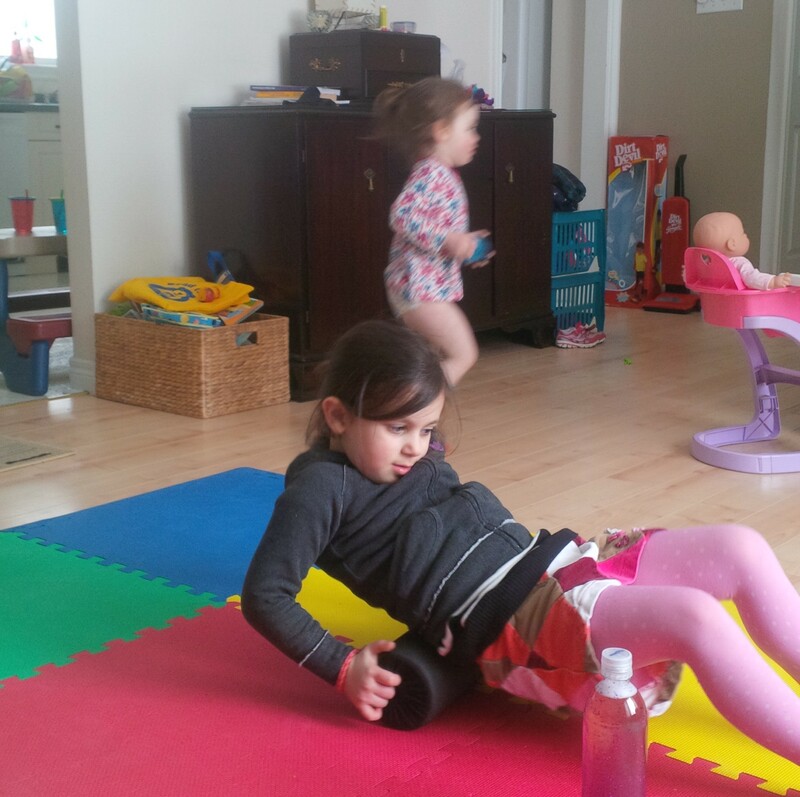 Hilary running laps, Lilly foam rolling. This might be TMI but, when Hilary was a baby, she would poop in the tub! Oh man, one night she did it four times which meant I had to change the water that many times. Can you see where this is going? Well, last night she was sitting on the potty and went poop! Lilly and I got all excited, cleaned her up and put her in the tub. Then she peed. Dang! I changed the water and put them back in. Then she pooped again in the bath. Dang #2…I had to change the water and clean everything up again. Ever feel bruised after working out? Parents: Funniest potty training moments? I am just so happy for you to be having some pain free runs! About TIME! 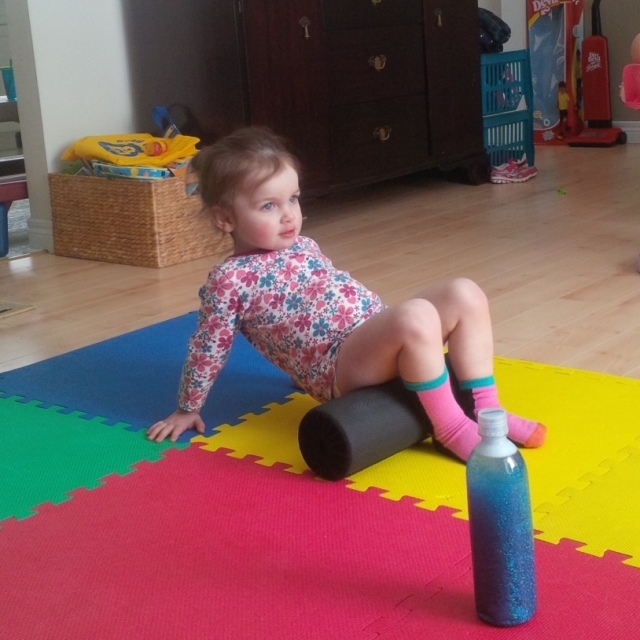 And the foam rolling + potty training is hilarious. GOOD HABITS FOR LIFE I tell you! It’s so cute! I usually can’t capture them but these pictures worked out okay! ahhh the joys of potty training!! lol! made me remember some similar stories from when we went through that phase! All I can think of is no more diapers!!!!!!!!!!!!!!!! What a glorious thought! Ha ha! The pooping in the tub is kind of funny! Happy your hammy is healing! !